Thakkali Kuzhambu is a well known recipe in all communities in South India . I just followed my Mom's recipe and got this Lip-Smacking Curry. 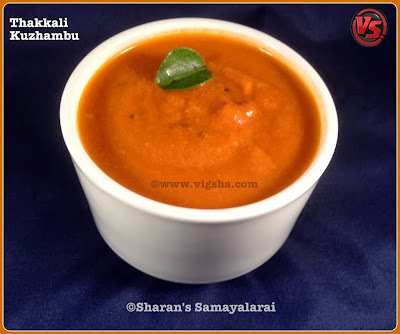 She makes this delicious gravy for Dosa / Idly varieties. It tastes heavenly and its a great rice-accompaniment too. 1). Heat oil in a pan, add cumin and let it splutter. Then add onions along with red chillies and saute till onions turns translucent. 2). Then add chopped tomatoes, salt and saute till they become mushy. Switch off and let the sauteed ingredients cool completely. 3). Transfer the sauteed ingredients to the mixer and add turmeric powder, coriander powder, grated coconut. Grind it to a smooth paste adding little water, keep aside. 4). Heat oil in a wide pan and add mustard, let it splutter. Then add curry leaves and saute till aromatic. Reduce the flame and add the grounded masala to this with ½ - 1 cup of water. 5). Adjust the consistency of the gravy and let it cook covered. Keep stirring in between to avoid gravy sticking to the bottom of the pan. When the gravy boils briskly and reaches the thick kulambu consistency, switch off ! Garnish with fresh coriander leaves and serve with steamed Rice, Idli or Dosa. # Shallots suits best for this gravy, how ever you can substitute it with big onions.